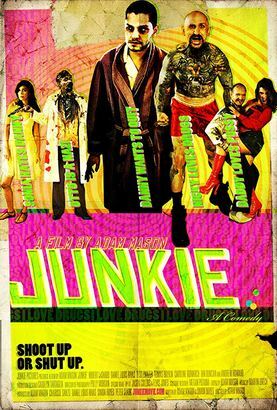 Junkie is a pitch black comedy about two heavily addicted, drug addled brothers, Danny (Daniel Louis Rivas) and Nicky (Robert LaSardo). When Danny decides he's going clean, Nicky reacts aggressively, driving Danny from one insane experience to another as a whole host of bizarre, surreal characters descend on their house, all with grievances to bear, debts to reclaim or trouble to cause. As Danny's life spirals out of control he must fight tooth and nail to kick the habit and unfurl himself from the web of deceit his addiction has enveloped him in. While attempting to repair the deeply damaged relationships with his increasingly bizarre friends and family, he unwittingly exposes personal revelations that threaten to unravel his entire existence as he knows it.